Nice set, looks good in son's room. I surely recommend this because for the price, the number of pieces are a really good deal. Buy this, you will not be sorry. Intelligent Design Matteo Comforter Set features creative stripes in cool and neutral shades. This modern stripe in wide and thin width combination using shades of blue and grey for a serene bedroom. Two decorative pillows bring the stripe motif throughout this entire collection with strapping details. My son chose this as his camp bedding and we were very pleases when it arrived. He loved the colors and everything felt soft. I did not read the details and was surprised that it had decorative pillows instead of sheets. I assumed it was comforter, sham, fitted, flat and pillow case. Not this set. I don't think there was a fifth item (definitely comforter, sham and two decorative pillows). The title is misleading if you are getting a twin set - only four piece. Great looking set with a great price. I actually purchased two of the identical sets for bunk beds. Looks great and an extra added bonus that it comes with two decorative pillows to add the finishing touch. The colors in the photo I feel may be off a little the lighter blue is more on the greenish side. Exactly what I expected. 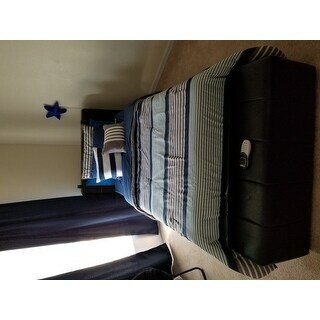 Comes with two pillow cases and two decorative pillows, doesn't come with bedskirt or sheets. Quality fair for price, perfect for my age 7 son. Great price, colors and neutral appeal for a guest bedroom. This comforter set brightens up dark furniture. Using this in a guest bedroom to brighten the appearance. Love this comforter set purchased one the first time and It was missing pillows overstock shipped me a new set and I am very pleased with it. I ordered Two of these for my Sons Room, They are Pretty but not the most plush however for my younger boys these will be just perfect ! The Pillows that came with them are a nice touch ! I love this bedding set. I bought it for my sons bedroom. It washed easy and looks great in the room. I am an interior decorator and believe in decorating on the cheap. I bought this set for my son thats 13 yrs old. He absolutely fell in love with it. It;\'s very soft and has vibrant colors that pops! I've washed it numerous of times and yet still has it vivid color of when I first purchased it. I am very happy customer and recommend to anyone! Got one for my stepson, he's 18, he likes it. There are a little bit of orange/brownish colored stripes in it that we didn't notice in the picture, but it didn't take away from anything. We're all pretty satisfied with it. He says it's warm too, and we have pretty cold winters. Nice casual set for guest room! Great price, great quality! Bought as a gift for house warming. Perfect weight, not too heavy not light perfect for year round use. Liked it also because it is unisex. Works perfectly for a teenager room. My son loves it! Bought this for my son's bed and he loves it. Perfect set for my young adult son's room. The color of his wall is a dark denim look and this set brightens the room. The quality is good, soft feel and easy care. Good quality color not close to what's depicted and I got two not one. "Can I place the comforter in the dryer?" "Is this off white / cream clor or a crisp white?" Hello 7310, we try to represent the colors of our products accurately. Unfortunately, due to the difference in monitor colors we cannot guarantee that the color will match exactly what you see on your screen. In my opinion, this is a true white. Thank you for shopping with us. It had good reviews, bought it for my grandson. "can you buy throw pillows for this set"
Hello LaRue, unfortunately no. Please let us know if you have any further questions.